Hilton Hotel and Suites is proud to introduce Ontario's first Romano's Macaroni Grill! 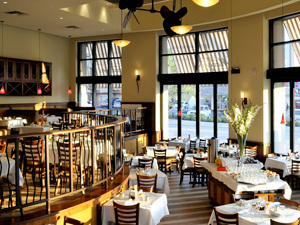 Romano's combines authentic Italian food and wine with a passion for hospitality and the richness of Italian culture. 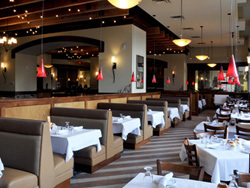 At Romano's Macaroni Grill, celebrate the culture, the passion and the tradition that is adored the world over. Here, the food is as fresh and flavourful as the place itself. It will transport you to a simpler time where festive music, authentic food and warm peasant bread will delight your senses. Romano's features an open kitchen, proudly showcasing freshly prepared foods and the unique brick oven at the heart of the restaurant. You'll find the menu is a blend of traditional fare and signature dishes. Appetizers include Bruschetta, Calamari and fried Mozzarella. Signature thin crust pizzas are handmade to order with fresh, authentic ingredients and the pasta dishes all feature imported pasta, freshly made sauces and a variety of Italian cheeses. At any time you may find the chefs roaming the dining room mingling with guests. Romano's chefs are very proud of their fresh authentic food and want to hear feedback straight from you! At Romano's, guests re-fill their wine glass as desired. The jugs are left right on the table. Romano's uses the honour system, something else they are famous for. Music and language round out the Romano's philosophy, so don't be surprised if you hear Italian language tapes playing in the bathroom or rich voices singing an Italian aria. Whatever you're craving, Romano's Macaroni Grill is sure to please. It's casual dining perfect for the whole family.